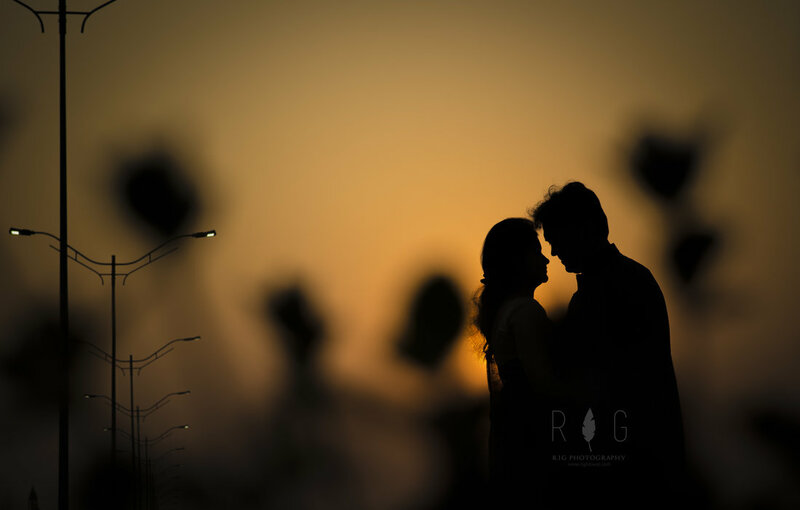 The 2018 nominee of the prestigious Better Photography Wedding Photographer of the Year Award, and the 2014 Nikon India Contest WINNER, Kolkata based Rig Photography specialises in a fun, off-beat and candid style of wedding photography and candid pre-wedding, staged & destination wedding, engagement and baby photography as well as couple portraits. We guarantee memories from your wedding that will last a lifetime. We are amongst the pioneers of the Indian Wedding Photography genre. From planning to execution to delivery, it has been a perfect experience working with team Rig. During those special 5 days of my life, when i really wanted a photographer I would be comfortable with, team Rig superceded my expectations. The professionalism, friendliness and eye for the art of photography are noteworthy. Excellent, Professionally taken and very friendly I would highly recommend rig. Very good work done in my wedding and pre wedding. Excellent and dedicated professionals who work very hard for customer satisfaction. Loved their work. Extremely happy with their services. Wish to work with them again in the near future. Thank you Rig Photography to capture my lifetime memories and turn it into a dream wedding album. We both loved your work so much. Thank you once again. Rig photography is awesome. The team is incredible and friendly. They have captured outstanding candid shots and every details of our wedding. Thank you Rig Photography. They have brilliantly captured all of the moments through the entire wedding. They not only captured my stunning bridal portraits of mine but also each every details including our guest to decoration. I am highly satisfied with them and highly recommended them. Best Photographey Team in terms of quality, commitment, dedication and creativity. Highly recommend. Loved their work. I will surely recommend their name as the best wedding photography group in town. Lovely experience :) Wil surely work with them in future again. Such a creative and enthusiastic team members. Patiently they were clicking throughout. Never rushed for anything. We just loved the service provided by Rig Photography and team. We would like to recommend this photography team to evryone.We liked the creativity and professionalism of the team as well as on time service. Thanks Team. Rig and team has such an amazing talent for capturing ‘moments’ which is exactly what you want on your wedding day. It’s not the formal photos that remind you how great your day was – it’s the natural fun and excitement that is so important to be documented. Rig’s ability not to miss a moment is incredible, and his energy and passion comes across in the photos. They are a bunch of highly talented and absolute professional photographers. The only problem we have encountered is trying to choose our favourites, because there are just so many amazing shots. If you are looking for a photographer to capture the true essence and feeling of your wedding day, then look no further. My wife and me cannot rate Rig any higher; he and his team are able to blend in so well with your guests that they literally will not realise that they’re being photographed. Their photos, albums, editing is absolutely perfect and flawless – our reception was on a cloudy night accompanied by sporadic rain, thank god we had picked Rig and Team to capture the event as the quality and number of special moments captured were outstanding through camera and drone. You will have no regrets if you go with Rig! All the best! He is our official photographer for the family now! Your message was successfully sent to Rig Photography. The Photographer may contact you soon.